That was the question asked by Peter Pan to the audience in attendance at the Lexington Opera House. As little heads popped up out of chairs and expressions of concern appeared, Peter Pan held a dimly lit fairy in his hand and called out to everyone that he needed them to believe if Tinkerbell is to survive. 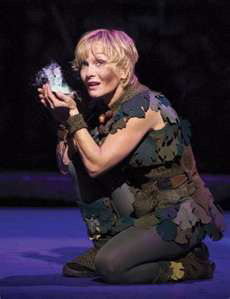 Cheers of “I believe” began to resound across the theater and Tinkerbell’s life light began to intensify. My daughter chants “I believe” and looks on as Tinkerbell rises and flies around the stage. She then looks at me for an expression of assurance that everything will be ok. I smile and nod my head and we watch the little fairy fly off of the stage and the curtain closes for the next scene. It is at moments like this one that I am reminded of the magic of art. To see things from the perspective of a child is a truly amazing experience. I thoroughly enjoy the ability to invoke an emotional response from the telling of a story, whether it is from a storyteller conjuring up a tall tale or an actor playing out the part. I’m grateful that I live in a community that supports artistic endeavors of all types and provides me with an opportunity to select and participate in this creative process. I want my daughter to have a limitless variety of creative experiences. I want her to grow up and reflect on the magical times that she spent making forts out of blankets, battling dragons on the staircase, or hunting unicorns in the forest. If you haven’t participated in any of these activities, I highly recommend them! I have become quite good with a sword and can engineer a fairly sturdy fort complete with tunnels and skylights. Art touches our lives in so many unassuming ways. We often times forget to notice them. Sometimes it takes a child to put things back in perspective and remind us of the magic that art holds.